Arnold Skolnick who designed the logo says that the dove on the guitar was actually designed to resemble a catbird . Years active Original festival held in 1969; namesake events held in 1979, 1989, 1994, and 1999. Genre Rock and folk, including blues-rock, folk rock, jazz fusion, Hard rock, latin rock, and psychedelic rock styles. 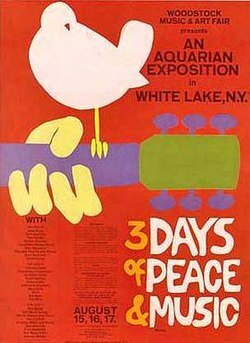 Woodstock Music & Art Fair was a music festival, billed as "An Aquarian Exposition", held at Max Yasgur's 600 acre dairy farm in the rural town of Bethel, New York from August 15 to August 18, 1969. Bethel, in Sullivan County, is 43 miles southwest of the town of Woodstock, New York, in adjoining Ulster County. Thirty-two acts performed during the sometimes rainy weekend in front of nearly half a million concertgoers. It is widely regarded as one of the greatest moments in popular music history and was listed on Rolling Stone's 50 Moments That Changed the History of Rock and Roll. The event was captured in a successful 1970 documentary movie, Woodstock; an accompanying soundtrack album; and Joni Mitchell's song "Woodstock", which commemorated the event and became a major hit for Crosby, Stills, Nash & Young.